South Dakota’s goose population has soared over the past 25 years. What are the reasons? A big one is the increase in overall habitat as noted in a new land-use study from South Dakota State University. Their results show a significant increase in both habitat (wetlands and forest) and open water acres between 2006 and 2012. These land-use changes resulted in total increases of more than 370,000 acres in just the past six years bringing the total of the two to well over 4.25 million acres. The most recent population numbers from a Federal Fish and Wildlife survey have the Canadian geese population at around 270,000 in South Dakota, three times above the state’s management plan. This is up from an estimated population of 120,000 in 2000. While goose hunting is a challenging sport, the increase in population bodes well for South Dakota waterfowl hunters. But it has been a headache for many farmers, especially those in the northeast as geese feast on fresh green growth (mostly corn, soybeans and wheat) next to water. 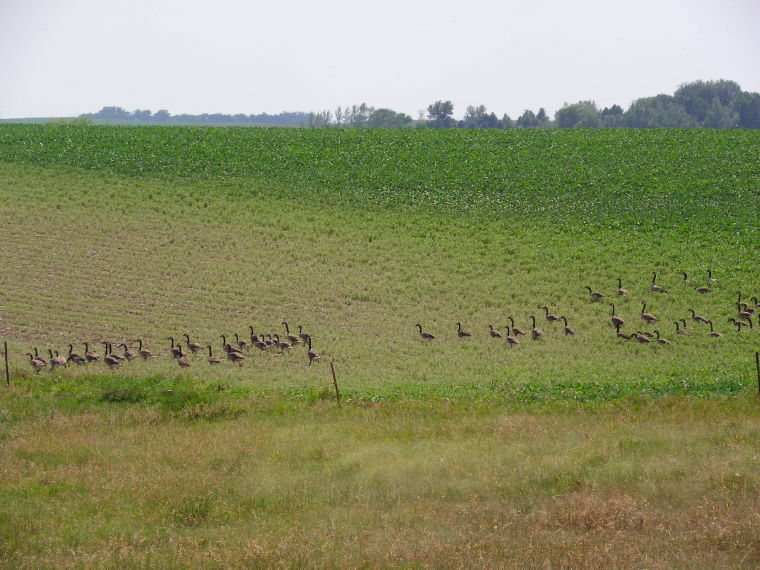 “The (goose) problem has been getting worse for the last ten years and we have a ways to go before it gets better,” said South Dakota Corn Council director Ryan Wagner, a farmer from Roslyn. The number of goose hunters in the state has fallen significantly from a decade ago but has plateaued in recent years. The number of geese being harvested has increased by nearly 50% from 2007 thanks to increased bag limits, according to the South Dakota Game Fish and Parks website. Besides increasing the bag limits for hunters, the state has made a number of attempts to reduce the population with special spring seasons and numerous depredation activities. South Dakota spent nearly half a million dollars ($467,895) on goose depredation activities alone in fiscal year 2013. Taxpayers aren’t footing the entire bill for the damage being done as hunters were charged an additional dollar when they purchased their license in 2013 to help pay for the depredation assistance. This entry was posted in Education, News and tagged corn, depredation, farm, field, Goose, South Dakota.